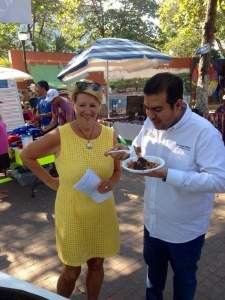 Jorge Sanchez Allec brought the most delicious stuffed pork to the Sailfest windup party. Here he is enjoying it a long with all the volunteers. The 17th Annual Zihua SailFest on February 5-11 was a spectacular success. The seven-day fiesta raised 2,109,923 pesos to provide educational opportunities for our least-advantaged children. The events included a welcome dance, concert, auctions and raffles, a chili cook-off and street fair, a gala dinner and daily sailing events. Approximately 80 cruisers and their local land-based supporters volunteered to organize and administer the events. 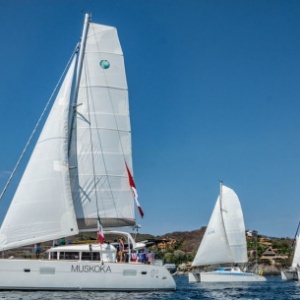 Forty-three sailboats from around the world — mostly from the US and Canada — participated. The cruisers were the heroes of the fiesta, taking more than 1,200 donating guests on sailing trips. 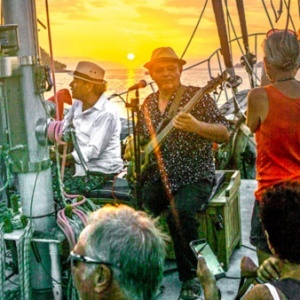 Prominent local and international musicians donated their talents to perform sunset concerts at sea. Cruiser committee chairfolks, Tim and Donna Melville, from the Nanaimo BC-based Baltic 42DP Northwest Passage 1, deserve special recognition for their promotion, organization, dedication and just plain hard work. They inspired all of us, and even found time during their 10- to 12-hour working days to buy a home here. The sailing events raised nearly 600,000 pesos. 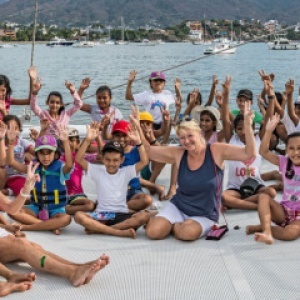 The Zihuatanejo community has enthusiastically embraced the dreams of the cruisers. More than 200 local businesses and artists donated gifts and services for the SailFest auctions and raffles, raising about 250,000 pesos for the kids. Compassionate annual donors, including Sailfest co-founders Richard and Gloria Bellack, retired teacher Jane Fiala, cruiser Pete Boyce, SOB Volleyball Vacations, and many others contributed more than $45,000 US. Zihua SailFest, in partnership with local government agencies, Rotary clubs, local donors, generous construction material suppliers and parents of the children, has built 110 classrooms, bathrooms, school kitchens and civic plazas (including 13 new schools), and established a nutrition program that provides 30,000+ school meals a year to hungry children, and has helped to provide hundreds of academic and English-language scholarships. Literally thousands of underprivileged, bright-eyed young Zihua scholars have benefited from the cruisers’ educational initiatives. Did I mention that we have a hell of a lot of fun while doing it?